Timber central stringer 42mm treads with riser beads, in Vic Ash. 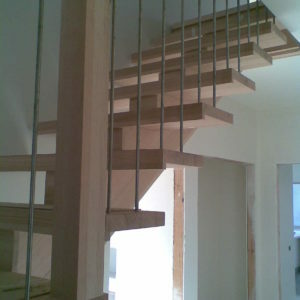 Balustrade consists of 90x90mm posts, 75x42mm handrail, 12mm round stainless balusters. 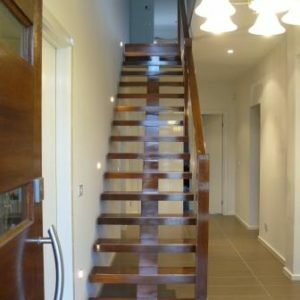 Timber Central Stringer Staircase with 66mm treads in Blackbutt with 2 aluminum strips stopped short from edge. Balustrade consists 90x90mm posts 70x42mm handrail with 12mm diameter stainless balusters. Timber central stringer in progress with 42mm treads (riser beads yet to be put in), in Vic Ash and 2x aluminium strips stopped short per tread. Bottom treads and risers in closed full stringer. Balustrade consists of 90x90mm posts, 60mm round handrail, 12mm round stainless balusters. 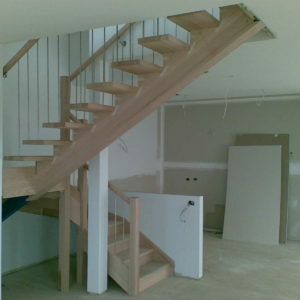 Timber treads and landing by Coastal Staircases. 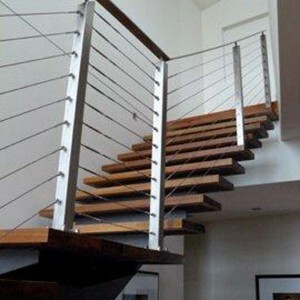 Steel central stringer and balustrade was outsourced by another supplier.